Igal Hecht is a busy man. 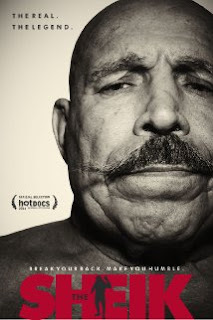 THE SHEIK is the third documentary he has directed over the course of the last four years, and he has finished yet another documentary that is awaiting release for 2015. The subject of Hecht's third effort is the infamous Iranian wrestling legend Hossein Khosrow Vaziri. Vaziri's story is the classic portrait of a rags-to-riches immigrant who puts in the arduous hours and does the crucial back-breaking work it takes to defy the odds and live the American dream. But dreams are meant to be crushed in most cases, and Vaziri's tumultuous professional wrestling career (combined with his proclivity towards danger outside the ring) exemplifies how far the fall from greatness can be. Khosrow Vaziri found his calling at the age of 14, shunning the typical teenage life of chasing girls in Tehran to become entirely focused on the sport of wrestling. His determination and dedication led to him joining the Iranian army at the age of 18, where he would begin a three year reign as an Army wrestling champion. At a time when Iran's national obsession was wrestling, the Shah of Iran took notice of his superior skills and hired Vaziri as his personal bodyguard. Dubious circumstances around the suicide of his mentor (Olympic gold medalist and political activist Gholamreza Takhti) and suspicions that the Shah himself may have been responsible for having Takhti killed, led Vaziri to eventually flee Iran for safe haven in Minnesota. For a person living in America for over 40 years, Vaziri's English is still quite imprecise and difficult to understand. Subtitles accompany his every bombastic boast to aid the viewer in comprehending the explanations of his various exploits. Vaziri's knowledge and wrestling talent (however proud he may be) were undeniable. An AAU Greco-Roman National Championship in 1971 and a stint as an assistant coach for the US Olympic wrestling team were taken notice of by Verne Gagne; a Minneapolis-based professional wrestler, trainer, promoter and founder of the American Wrestling Association. His introduction to the world of pro wrestling included years of grueling labor throughout the Midwest. Outside of his regular matches, Vaziri was driving trucks, setting up and tearing down rings and even refereeing. In 1977, Vaziri grew out his trademark mustache, shaved his head and donned the curly-toed rasslin' boots to take on the persona that would become known as the ultimate heel: The Iron Sheik. Hecht interviews a plethora of wrestling legends that not only speak to Sheiky's reputation for being a dominating powerhouse in the ring and backstage party animal; they also attest to the heat brought upon The Sheik during the Iranian Hostage Crisis and his struggle to survive violent crowds (apparently he was stabbed on more than one occasion). The Sheik played a key role in ushering in the “Hulkamania” era and the absurd popularity of wrestling in the eighties that followed. Also absurdly popular in the eighties was cocaine, a drug which The Sheik was arrested for having possession of in 1987; an incident which led to his dismissal by the WWF. The main focus of the documentary is the darkness that follows the end of his successful run in the WWF. Vaziri details the horrors of the independent wrestling circuit, financial ruin, his crippling physical maladies, crack addiction, family turmoil and a tragedy that profoundly changed him. Hope comes in the form of an unlikely friendship and the genesis of a truly unique social media presence that provides a once destitute and broken man with new and meaningful opportunities. THE SHEIK is an unflinching look at a former superstar who hits rock bottom and adeptly tracks his path to redemption. 3 out of 4 stars.